An award is being offered for a man who stole a TV. Uniondale, NY - March 4, 2014 - Crime Stoppers and the Nassau County Police Department are seeking the public’s help with identifying the subject pictured above. The subject is wanted in connection with a Commercial Burglary that occurred in Uniondale, New York. 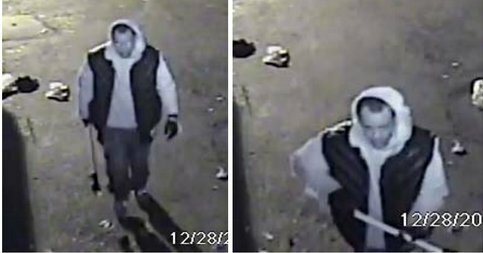 On Saturday December 28th, 2013 at approximately 1:27 AM, the unknown subject pictured above broke into the rear of a vacant store located at 977 Nassau Rd in Uniondale. Once inside the subject then attempted to gain entry through the wall into the adjoining business Serena Wireless located at 975 Nassau Road. The subject later fled the scene with a television. The subject was wearing a hooded sweatshirt, colored vest, and jeans. Crime Stoppers is asking anyone who knows the identity of the subject, or anyone with any information about this crime to call our toll free hotline: 1-800-244-TIPS (8477). Subject: LongIsland.com - Your Name sent you Article details of "NCPD Looking for Commercial Burglar"